Rev. Benjamin Franklin Fronabarger was born March 10, 1860 in Fort Deposit, Butler County, Alabama. While in his early teens he made the decision to give his life, heart and soul to God and preach the Gospel. He moved to Eaglesville, Tennessee and entered Eaglesville Academy. Eaglesville Academy was a small school but it was considered one of the best with its high scholastic standards and a moral background second to none. It was here that B. F. Fronabarger’s ambitions grew. He had no fine clothes to wear but he set a high standard and lived up to it. He worked hard and studied. His dream was to travel west and establish a similar institution with the same ideals and principles he had learned at Eaglesville Academy. After graduation in June of 1884 the 24 year old headed west. He preached along the way while constantly seeking a place for a school. He finally arrived in a small little Texas town in north Parker County. It was here, in Springtown, that he established the Springtown Male and Female Institute. He headed this school for the next ten years. Rev. Fronabarger preached in practically every town and village in Parker, Wise, and Palo Pinto Counties. His services were in such great demand that he was only able to accept a small percentage of the invitations he received. In 1895 he gave up teaching and put all his time into the ministry. He moved to Weatherford in 1895 and eventually became pastor of the Second Baptist Church (now known as North Side Baptist Church). Thomas Calvin Kuykendall came to Poolville, Parker County, Texas with his parents in 1882 from New Hope Arkansas when he was only 16 years old. Unlike Rev. Fronabarger he did not have the opportunity for a formal education. He was born on a farm near Arkadelphia, Arkansas on September 10, 1867. There was no free public education. In Poolville Tom wore many hats. He was a clerk in a general store, he helped his father dig wells, he was a farmer, a clock fixer, a barber, he broke horses, and was often consulted as an unlicensed veterinarian from his knowledge of animals that he learned from reading medical books. In 1888 he joined the Poolville Baptist Church. After reading the Bible for three days and nights he was baptized. From then on his life began to change. He was called to the ministry. He then felt the need for an education more than ever. Partly encouraged by Rev. 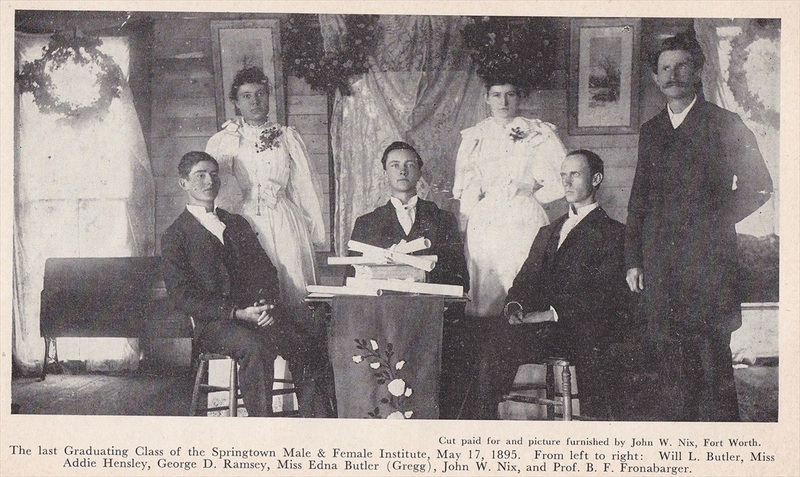 B. F. Fronabarger, the 21-year-old Tom enrolled in the third grade at Poolville schools. He advanced rapidly and soon received his teaching certificate. He taught school for many years in Wise and Parker Counties. But he eventually moved with his wife and children to Waco were he attended Baylor University for theological training. He retuned to Parker County in 1905 were he became pastor of Poolville Baptist Church and a year later, in 1906, he was elected missionary of Parker County. During his ministry he traveled rugged roads by buggy to little churches in the wildwoods. He was a pioneer preacher and a home missionary. He was well known for his faithfulness in visiting the sick and dying in an era when they were cared for in their own homes instead of hospitals. He also comforted families in troubled times and helped collect money and provisions to aid those in need. He conducted training sessions for Sunday school teachers, and church youth leaders, and he held revival meetings under brush arbors dimly lit by little more than the kerosene lamps he always carried. In July of 1910 Rev. B. F. Fronabarger and Rev. T. C. Kuykendall came together and held a revival in a brush arbor next to Clear Fork Creek on the southwest side of Old Springtown Road in the Wright Community. At the close of service, the Friendship Baptist Church was founded. Thereafter the Wright Community School House, which was also located here, was used for holding church services. Bro. Fronabarger would come once a month in the evening to preach. He came the 3rd Sunday of each month. However, the church members held Sunday school every Sunday morning. Some of the churches charter members include: Mrs. Gladys Waldrop Thompkins, Maude Waldrop, Mr. and Mrs. Hollie Ruark Dobbs, Mrs. Eva Crelia, Mrs. Ann Murphy, Mrs. Ida White, Mr. and Mrs. J. L. West, Mr. Bob Pendergrass, Mrs. Emma Mathers, Mr. and Mrs. W. F. Clendening, Mr. and Mrs. Frank Barker, Mr. and Mrs. James Edward Clark, and Bro. Henry Phillip Sharpe. This small country church has seen many pastors pass through its doors in its 100 plus year history. Fred Puryear was pastor at different times for a total of 17 years. Other pastors included on the list in the minutes of the Parker County Association Southern Baptist Yearly Conferences are: B. F. Fronabarger 1910-1912, D. P. May 1913-1916, A. L. Miller 1949-1950, F. A. Davidson 1951-1952, and C. W. Stuart 1952-1953. However, the most enduring was Pastor Houston Hook. Rev. 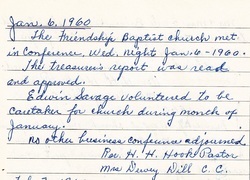 Hook served Friendship Baptist Church from 1954 to 1976. He preached his first sermon at FBC on July 11, 1954 for the Wright Community Homecoming. A week later he accepted the call as part-time pastor. At this time there were only 37 church members. Bro. Hook preached fiery and dynamic sermons that touched many lives. However, the first five years were hard for Rev. Hook. Membership was so low that it was called “The Widows Church” because the men didn’t attend. It took time for them to warm up to Rev. Hook. Rev. Hook was the only paid staff at that time and funds were so scarce that he had to request a pay cut. And on several occasions the church treasurer used her own money to pay the monthly bills. But the church was determined to grow and membership began to perk up under Rev. Hook. On June 30, 1974 he was honored for twenty years of service to Friendship Baptist Church. The church would eventually outgrow Rev. Hook. He had been a part time pastor but now it was in need of someone full time. In 1976 Rev. Houston Hook stepped down for the good of the church. Other pastors that served Friendship Baptist Church before and after Rev. Hook include: Jimmy Dobbs, D. T. Land 1977-1979, Steve Gouge, J. D. Kay, Jerry McFather 1983, Jerry Crocker, Rickey Brunson 1993, John Harlan, Richard Sego 1994-2001, Adam Greenway, Toby Easley 2002-2007, Sam Cotter, Mike Williams, Todd Houston and the current pastor that accepted the calling in 2013 is Bro. Zach Crook. In 1953 Friendship Baptist Church ordained its first deacons, Earl Ellis and Timothy M. Hardin. Other deacons later ordained where: Ben Long Jr. (1961), Melvin Woody (1966), Milfred Meadows (1966), Claude Haley (1973), Duard Ruland (1973), Albert Linehan (1975), Fulton Stone (1975), Buddy Phillips (1975), John Wells (1977), Archie Cooper (1977), Ronnie McNutt (1977), Bruce Bryant (1991), Jerry Laster (1991), and Steve Wilson (1996). The first business meeting was held January 6, 1960. Friendship Church also spreads the gospel by way of mission trips. The first mission trip was to Mexico and was led by Bro. Terry Land. The farthest was to Honduras lead by Bro. Richard Sego. And today Mechelle Bryant goes to Russia each year and works to help spread the gospel. 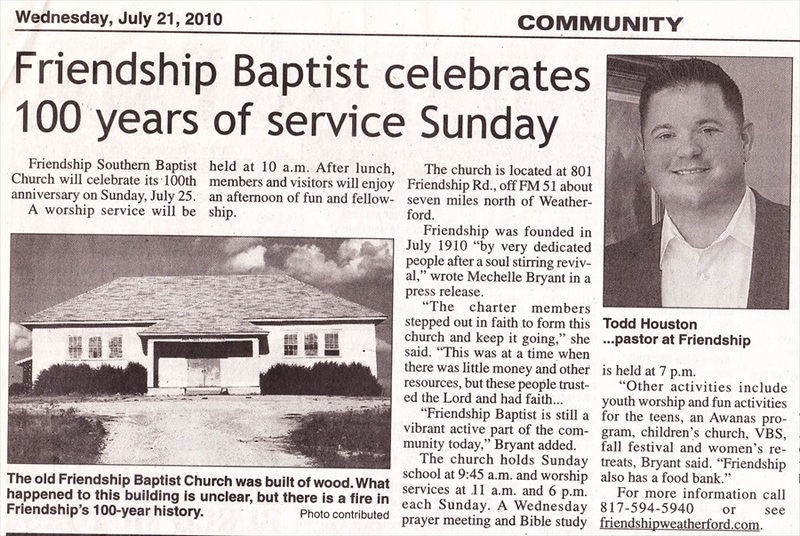 Friendship Baptist Church has seen many changes throughout its 100 plus year history. In 1923 the original Wright Community Schoolhouse was torn down. The boards were used to rebuild the school across the creek at Friendship Church’s present location. From 1923 to 1945 church services were held in this new schoolhouse. Then in 1945 the Wright School consolidated with Carter and Roberson Schools. School was then held at the North Side Consolidated School on Highway 51. Thus, the Wright School was no longer needed for classes. The Wright School trustees were going to sell the schoolhouse and land, but Friendship Church still needed a place to worship. The members of Friendship Church decided to raise money in order to buy the schoolhouse and the land. Because there were no men deacons at this time, the church appointed Mrs. Robert Loyall (Mamie) Woody, Mrs. W. M. Woodle, and Mrs. Dewey (Eula) Dill to raise the needed funds. No active church services were held during a short period in the 1930’s. Average attendance was 13 in 1945 when J. L. Isbel held a revival and the church reorganized. With only 13 members on the church roll, the original building and property were paid for on December 1, 1947 and the Wright School became Friendship Southern Baptist Church. A strong windstorm severely damaged the church building in 1957 and the damaged building was torn down and rebuilt. This is the same building that is used for the children’s classrooms today. Rev. Houston Hook held the first service in the new building on August 17, 1958. Church membership soon doubled under Pastor Hook. The first Baptismal service held inside the new church building was on October 5, 1958 for William Lavoy Dobbs, the great grandson of Parker County pioneer George Lee Dobbs (1825-1906). Before the Baptistery was added all Baptisms were done in local ponds and creeks. For the next few years the church flourished. More Sunday School rooms were needed and in 1966 the east educational wing and kitchen were added. The church was certified and incorporated on June 20, 1971. And as it continued to grow even more a new auditorium was built. The new auditorium was used for the first time on November 26, 1972. In 1976 it was voted to build a new sanctuary with a little modification to hold more people. This is the one used today. It was then decided to build a small building behind the east educational section. This was completed in 1977 and a new fellowship hall, which includes a kitchen and parlor, was completed on January 14, 1979. The parsonage was added in 1998. And the most recent addition to the church is the Family Life Center, which was dedicated in October 2004. Planning and construction of the Family Life Center took over two years to achieve at a cost of $650,000. This small country church has thrived throughout the years by holding revivals. They also voted to form a Brotherhood and hold Vacation Bible School each summer. And in the early years, in order to save money, each family volunteered to clean the church a month at a time. In the 1950’s and 60’s there was Sunday School and Training Union each Sunday. On August 31, 1969 Ronnie Boney was called as Youth and Music Director. His wife Catherine played the piano. They stayed until 1975 and his music added much to the services and ever-growing youth department. There have been many music directors since that time. Mrs. Eula Dill and Mrs. Robert Loyall (Mamie) Woody filled in during the times when the church was without a pianist. Friendship Baptist Church has been a blessing to the community. They have several programs and outreach activities. Each year there is a Fall Festival for the kids, a blood drive at the festival, the ladies have Bible Studies, retreats and conferences. And church socials are also held quite frequently. Unarguably, one of the most impressive contributions the church has made to the community has been its food bank. Kem Mills founded the food bank 15 years ago on February 25, 1999 and she currently serves at its director. Kem started the food bank after her two children were killed in a house fire. She had turned to the community and church for support during this tragic time of her life and she wanted to “help back”. So when several families in crisis approached the church for help, Kem rose to the occasion. She had no prior experience running a food bank. She just dove right in but word quickly got around. A Pentecostal church was closing its food bank and offered her frozen food. A man in Fort Worth gave her 2,000 pounds of potatoes, which her husband hauled in on a flatbed trailer. Kem purchases much of the food from the Tarrant County Food Bank with donated funds. It takes Kem and other volunteers 5 days to prepare for only 2 hours of opening every Tuesday morning. The food bank feeds about 300 people every month and is solely funded by contributions by the church members and private donations. Besides them both being part of the Wright Community, Friendship Baptist Church has strong ties to Clark Cemetery. On May 6, 1933 James Gaylon “Jimmy” Dobbs became the first and only pastor ordained by Friendship Baptist Church. Rev. Jimmy Dobbs officiated many of the burials at Clark Cemetery and is buried there himself. In fact, many of the charter members of Friendship Baptist Church are buried at Clark Cemetery, including Hollie Ruark ”Colonel” & Addie Dobbs, Eva May (Dobbs) Crelia, Frank & Wynunee Barker, James Edward “Jim” & Margaret Elizabeth “Betty” Clark and Bro. Henry Phillip Sharpe. And the oldest active FBC male membership on record is that of Clark Cemetery Trustee Duard Ruland. Duard is the grandson of Charles Arthur Ruland, who on July 17, 1953, along with William Alexander Clark, officially donated the land for Clark Cemetery. Looking at Friendship Baptist Church today it’s difficult to imagine its humble beginnings…country folk traveling by buggy as they gathered at the Clear Fork River under the brush arbor. It has survived storms, lack of funds and even low membership at times. But is has done more than just endure these hard times. It has grown. And its congregation prays that it will be a blessing to future generations as the past efforts are to the present generation.